Rep. Paul Ryan of Wisconsin, fresh off a loss in his bid to be vice president under former Massachusetts Gov. Mitt Romney, said on Tuesday that he does not believe voters gave President Obama a mandate to govern in last week’s election. “They also reelected the House Republicans, so whether people intended or not, we've got divided government," Ryan told ABC News’ Jonathan Karl in his first national interview since the loss (he also spoke with Wisconsin media outlets on Monday). Had voters fully embraced the president -- and by extension, his call to raise taxes on top earners -- “they would have put Nancy Pelosi in charge of the House of Representatives,” Ryan said. Democratic House candidates actually won more total votes than their Republican counterparts, according to Ian Millhiser at the liberal blog ThinkProgress. But the way districts are drawn allowed Republicans to maintain the majority they won in 2010. Still, ahead of any deals being cut, Ryan is maintaining his opposition to any increase in tax rates, saying that closing loopholes will be “a better way” to raise government revenue. "Raising tax rates hurts economic growth. 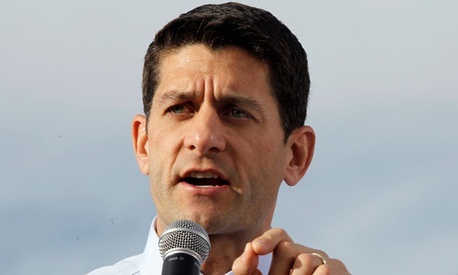 And of all things we need right now -- to prevent a fiscal cliff, prevent a recession, prevent a debt crisis -- is we need people to go back to work," Ryan told Karl. "There are other ways of getting more revenue into our government without damaging the economy, and that's the kind of thing we hope to achieve." Ryan pledged to “continue to be a champion of ideas” (House Speaker John Boehner, R-Ohio, calls him a “policy wonk”), but declined get more specific about what kind of deal might be reached with Democrats. “I don’t want to get into negotiating with the media,” he said. “It was a bit of a shock when we didn't win, but that's just the way these things go,” he said.